Sometimes, when I see restaurants opening in Hoboken, I am wondering if the owners did some research before and it is sad to see some of them closing after only few months. But, when we learned that a Persian restaurant would open on Washington street, we thought it was very smart: there is no such restaurant in Hoboken. So we were looking forward for Seven Valleys to open. Know that The Seven Valleys is a book written in Persian by Bahá'u'lláh, the founder of the Bahá'í faith, that is the faith from the owner, Dale Ryan, who also owns Bwé on the next block. Kashke Bademjan or sautéed eggplant prepared with a blend of herbs and spices, sautéed onions and yogurt. Delicious if you like eggplant and perfect on the bread. Jodi ordered the vegetarian kebob, made with eggplant, mushroom, onion, pepper and tomato. It was served with rice (as I am writing the post, I see that it is supposed to be served with hummus but she did not get any). On my side, I got the soltani kebob that is composed of one beef kebob and one koobideh (seasoned ground beef). The meat was delicious: not dry, juicy and very tasty. 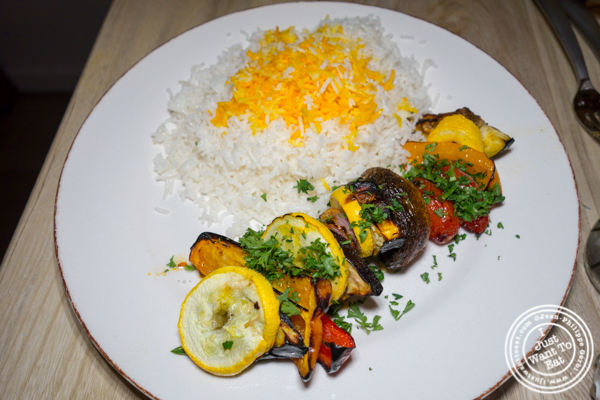 I ordered it with a specialty rice that was the Baghali Polo, a saffron basmati rice served with Persian dill and lima beans. Quite good, it was a bit dry and I should have ordered some Masto Khiar that is yogurt, cucumber and mint. Last was dessert: we tried their baklava that comes, probably like the bread, from a bakery in Paterson, NJ. It was one of the best baklava I had: flakey, buttery and a nice amount of honey. Overall we had a nice dinner at Seven Valleys: this is definitely a nice addition to the Hoboken restaurant scene!